The Crimson Tide drop 2-1 contest with Canby in playoffs' opening round at Hare Field. The Glencoe girls' soccer team was riding a high of their first league championship following their 9-1 win over Forest Grove last Monday, Oct. 22, but that all came tumbling down in the second half of their first round playoff game versus Canby Saturday, Oct. 27, on a cool and rainy night at Hare Field. The Crimson Tide took an early lead, were tied nine minutes into the second half, and then watched their season circle the drain as Canby freshman Joey Baguio gutted the home team and crowd with a breakaway shot that cleared the Glencoe goalie and crept under the crossbar on its way to the back of the net. The goal, and the subsequent Cougars win, set off a raucous celebration in front of the visitors' bench. It also triggered the end to a Glencoe senior class that won't soon be forgotten. "These seniors did a lot," said Crimson Tide head coach Josh Richards. "They brought this program from one that had not really accomplished much, to one that made the playoffs every year, that made it to the second round twice and the semifinals last year. It's been an incredible run, and one the school will never forget." Despite the 1-0 halftime lead, the Tide seemed to play with trepidation in the second half, looking more like a team trying not to lose rather than put away their underdog opponent. "We had such high goals and such a clear vision of how we wanted things to play out. When it didn't, I thought we got that deer-in-the-headlights look for a while, and you saw that play out and we started to panic," Richards said. "Maybe it was the moment, the emotion, the weather, I don't know, but you saw that play out, and that's sports." On the flip side, Canby coach Maria VanAcker was elated with the result, and more so with the manner in which her team played and has played all season. "The girls have been training really diligently over the entire season and especially over the last few days, and everything we've been working on they really executed out there and the result shows that," the coach said. "We come to compete every game, and Glencoe's an incredible team, but our girls were confident, and they play with confidence every day. They know what they're capable of, and they show it every game." After a relatively benign opening to the game, the Tide got the game's first goal in the 20th minute when senior forward Sarah Mauk took a throw-in from the left side, then turned and fired a shot from roughly 15 yards past the Canby goalkeeper and into the left side of the net. Glencoe took that lead to halftime, then seemed to clam up in the second half, playing with a muddled sense of urgency that seemed to separate them from their usual game. "We looked more desperate than we needed to be," Richards said. "If we had just played like we had all year, we would've had success, but it's easy for that moment to supersede the simplicity of the game and the things we'd worked on all year. We got ahead of ourselves, which is something we didn't do last year — but this year, it got us." Canby evened the score in the 49th minute when Baguio blasted a shot in from the top of the 18-yard box. It was at that point that you could feel the momentum swing, freeing up the visiting Cougars and tightening the screws on an already-hesitant Glencoe team. The clock then ticked away as the two teams looked desperately for a game-winner. 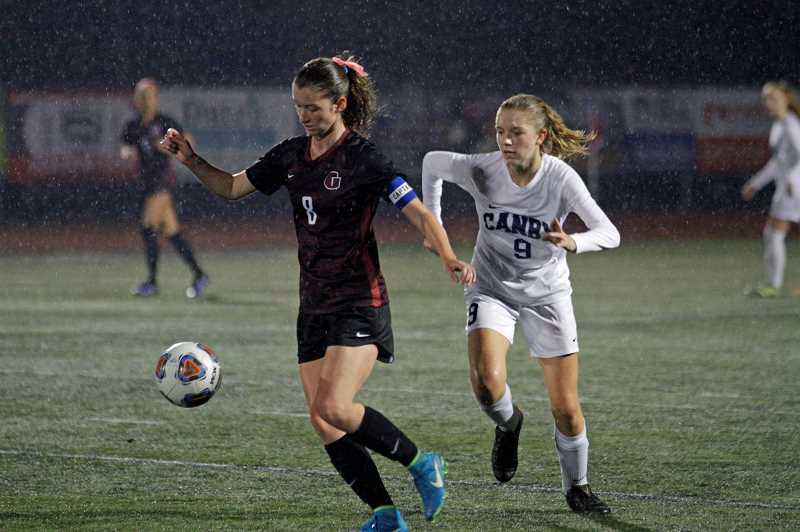 The Tide had a series of opportunities, including a couple corner kicks over the last 25 minutes, but it was Canby that capitalized on one of their very few late looks at the net. With just under three minutes remaining, a loose ball got past the Glencoe defense near midfield. Baguio beat the Tide to the ball, streaked up the right sideline, and, with two teams of players bearing down on the freshman, he cracked a shot from beyond the 18-yard box and over the outstretched Glencoe goalie's hand, giving Canby a lead it would never relinquish. "I really was just thinking I wanted to make it for my team," said Baguio. "Everything kind of happened so fast. It was just great to see the team celebrating after the game." "She's got some firepower and is a really driven kid, and a great kid on and off the field," VanAcker said of her freshman standout. "I've loved her spark this year and her determination has really taken this team to a different level. What a great shot." For the Tide, especially their seniors, it was a bitter end to an otherwise charmed four-year career. But while losing was difficult, Coach Richards didn't want it to get in the way of what was a truly great journey. "I can't thank them enough, and that's why it was so difficult to watch those 13 seniors finish their careers that way," said the coach. "It's been a special group, and they accomplished some special things."